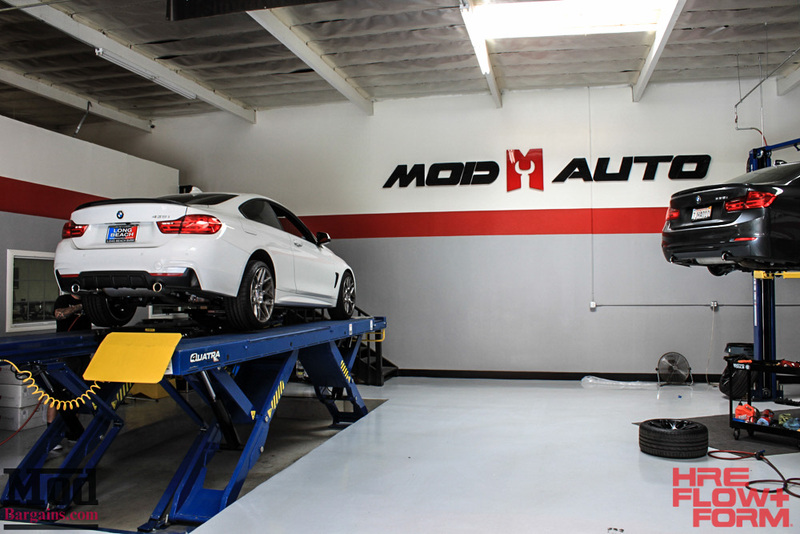 As we mentioned a few weeks back, we now offer Alignment services at the ModAuto install shop in La Habra, CA. 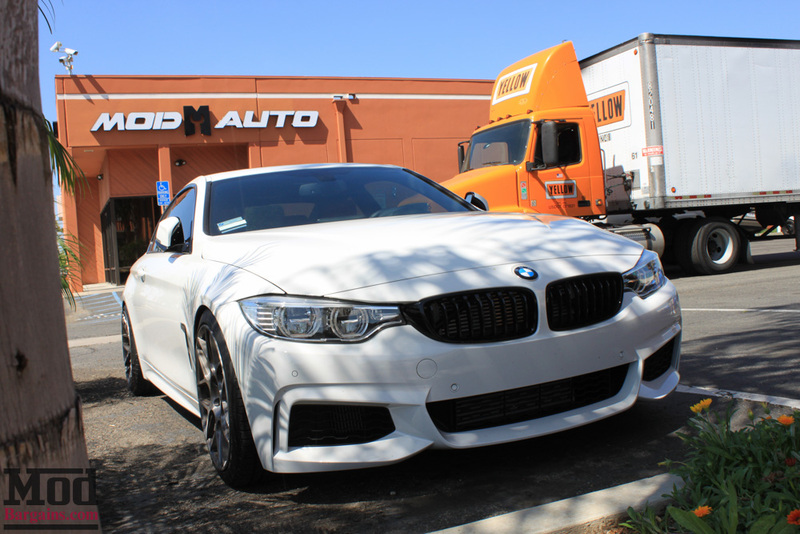 This gorgeous BMW-Performance-kitted F32 BMW 435i M-Sport rolled into the shop sitting low, a prime example of the aggressive style of this particular F32. Our alignment rack was installed in a pit recessed in the floor, so that even the lowest of low cars are able to get onto the rack and get an alignment without much drama at all. Since we do a lot of business fitting cars with nice sets of wheels, naturally we needed to be sure that whatever system we used would not scratch up the wheels a customer has just waited a while to get. Our state of the art alignment equipment was also specially selected because Co-Founder Mike Brown demanded that we have an alignment system that wouldn’t mess up wheels and would still be usable on lowered cars where you might not have clearance in the fender wells – it was a tall order, but we got exactly what we wanted in the alignment systems we now have installed. A set of moveable central hydraulic lifts allows us to lift the car while it’s on the lift so that the ModAuto techs can make adjustments to the suspension more easily. While they’re details most people won’t notice, up close you can appreciate the gloss black F32 Fender Trim and painted front reflectors for BMW F32 that get rid of those nasty amber sidemarkers that clutter up the BMW F32 exterior appearance. 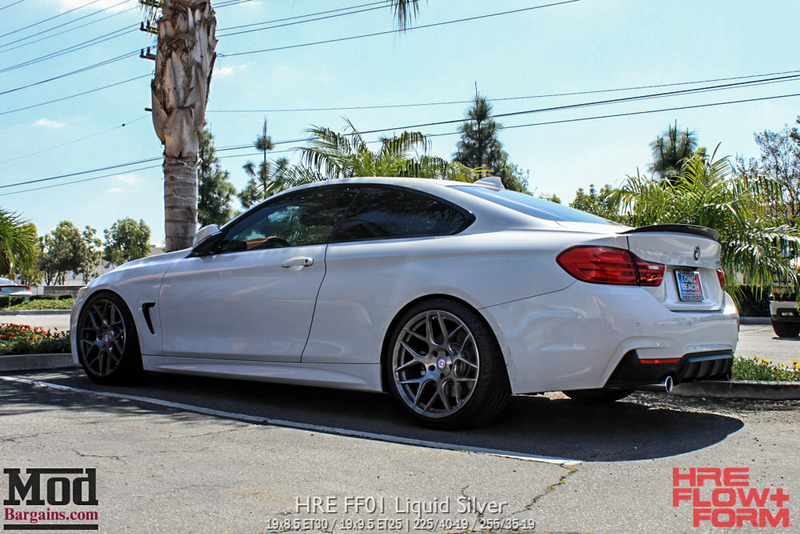 From this view we can also appreciate the Carbon Fiber BMW Performance Rear Spoiler and the aggressive BMW Performance Diffuser for F32 4-series w/ M-Sport Rear Bumpers. Of course, BMW Performance Gloss Black Kidney Grilles are a great addition to virtually every late model BMW. Thanks for reading, we hope you enjoyed the photos. In Southern California and need an Alignment? Click here to schedule an appointment, or call 714-582-3330. 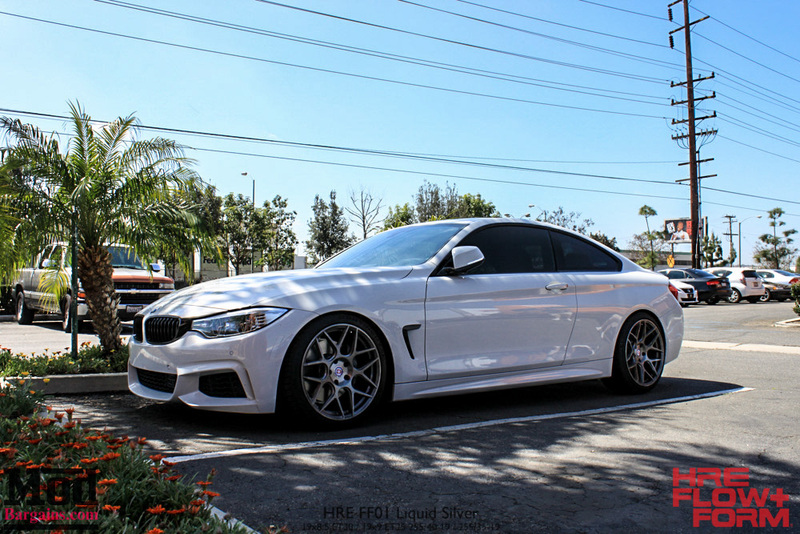 Interested in a set of wheels for your BMW 4-Series? Talk to our Mod Experts – with decades of experience modifying cars and wheel fitments under our belts, our guys live up to the title “Mod Expert”. 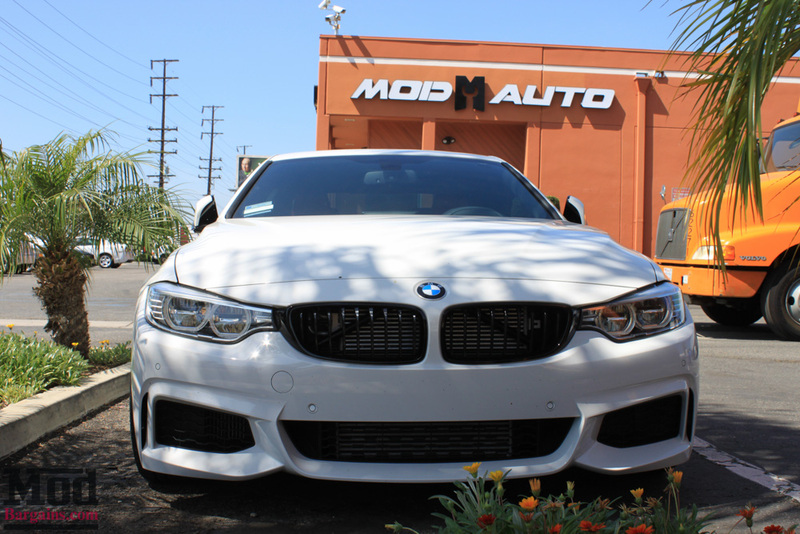 Let us show you what we can do for your car – chat live at ModBargains.com, talk to the experts at 714-582-3330 or stop by the ModAuto showroom in La Habra, CA on Lambert Rd/Harbor any day during business hours to consult a Mod Expert in person.